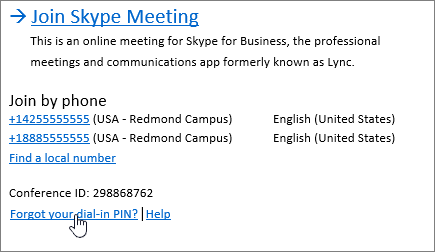 Your PIN is initially assigned to you by your Skype for Business administrator and you might have received a notification email when it was set up. If you didn't receive a notification, or don’t remember your PIN now, follow the instructions below to reset your PIN. Do I need to use a PIN every time I call into a meeting? Most of the time you don’t need a PIN when you call into a Skype for Business meeting with a phone. All you need is the phone number and Conference ID, which you'll find in the meeting invite. You’re the meeting leader (presenter), and calling from a phone that isn’t connected to your account, such as a personal cell or home phone. You’re an attendee, but the meeting is locked and you need to be identified before joining. In your meeting invitation in Outlook, click Forgot your dial-in PIN? Under Personal Identification Number (PIN), click Sign In. Choose your language and click Sign in. Type the same user name and password that you use to log into Skype for Business or your company's network. If you’re having trouble signing in with your user name and password, see Need help signing in to Skype for Business? Under Personal Identification Number (PIN), click Reset your PIN, and follow the instructions on the page to create a new one. After you reset your PIN, call the audio number in your meeting invitation and enter both the Conference ID and the PIN when prompted. You’ll also find additional helpful information on the Dial-in Conferencing and PIN Management page, such as your PIN expiration date, local numbers, and touch-tone commands (DTMF) on your phone. Make sure to check the bottom of the page for the commands to mute, unmute, and other actions.